Most popular TutoTOONS game for girls now with new baby daycare and playtime activities! Meet Sweet Baby Girl Alice in her house and play the games that you love! Have fun in 11 different rooms or play outside in the yard. Enjoy your favorite baby activities: baby bath, baby food & bedtime, cake baking, birthday party, dress up, tea party, room cleanup, postcard decoration, butterfly catch, and flower picking! 3 extra activities will keep you excited every day: watch kids’ movies, collect stickers and win extra coins! Bath Time & Dress Up! Learn why Sweet Baby Girl is crying and help her take a warm bubble bath. Baby bathing is very important. Learn to bath a baby and dress up Sweet Baby Girl with soft clothes! Mash apples and bananas to make fresh and healthy baby porridge. Don‘t forget to clean up Alice after she has her baby food. All babies need milk - prepare a bottle of warm milk before it‘s bedtime! When Sweet Baby Girl is older, get ready for her 3rd birthday party. 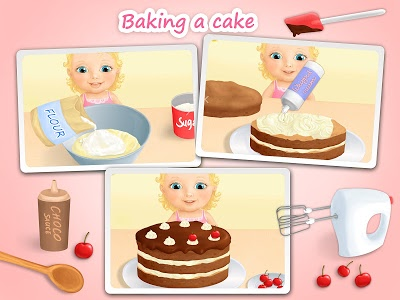 Start by making a yummy chocolate cherry birthday cake. Bake the cake in the oven and decorate with whipped cream, chocolate and cherries! Sweet Baby Girl turns 3 - make this day special for her and decorate home together! 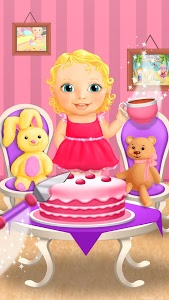 Create birthday decorations, dress up baby girl in a beautiful pink dress, meet her friends and party at home! When the best birthday party is over, you know it’s time to clean up the mess in Alice’s room! Put her things in places, clean the window, water the flowers, wipe the table and vacuum the carpet. Sweet Baby Girl Alice will be very happy that you help her! Alice invites you to play tea party with her toys Bunny and Teddy Bear! Learn how to set the table for 3, let your guests taste delicious tea and cut a slice of yummy cake for each of them. Show your best tea party manners and learn to share with others! Don‘t forget that all kids need to spend time in a fresh air! Play outside with Alice and catch colorful butterflies with a butterfly net! Choose from the cutest baby clothes, shoes and accessories to dress up little Alice! You’ll find everything you need to dress up a baby in style: baby pajamas, leggings, t-shirts, socks, baby pacifiers, newborn bibs, winter snowsuits, hats, mittens, shoes, toys, and, of course, super cute kitty cat ears headbands! Time for little baby arts and crafts! Alice has her art materials and she wants to make some postcards for her friends. Create 3 kids postcards with bunny, teddy bear and pink unicorn! Sweet Baby Girl wants to go outside again. Pick beautiful spring flowers together and make a flower crown! But don’t touch the cactus - it can hurt your hands! Little Alice loves stickers! She even has her own sticker book. Play with Sweet Baby Girl and you’ll be rewarded with stickers every time you reach a new level! Sometimes Sweet Baby Girl Alice likes to go to the attic and watch movies. Join her and you will get extra coins! If you need extra coins for new cute baby clothes, simply spin the magical wheel. You can win up to 500 coins every day! - Play inside Sweet Baby Girl‘s house or in the yard! - Try on 58 super baby clothes and toys in 11 categories! - Collect 8 stickers and see what they look like when you get them! - Spend time in the yard catching butterflies or making a flower crown! - Kids favorite baby care and play time activities! 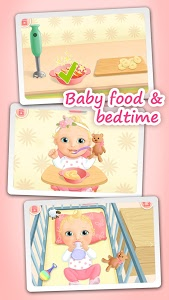 - Amazingly cute graphics, sounds and babies! - Easy to play even for toddlers and little kids! Similar to "Sweet Baby Girl - Dream House and Play Time"